Halloween cupcakes collection There are 8 products. 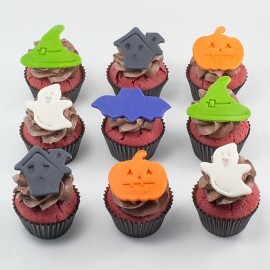 Halloween cupcakes with edible Halloween illustrationsOnly available in store or for delivery in the Greater Montreal region. 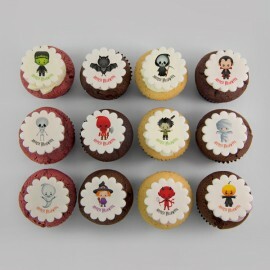 «Dia de los muertos» illustration Cupcakes for Halloween. Only available in store or for delivery in the Greater Montreal region. Halloween «full moon» cupcakes with edible Halloween illustrationsOnly available in store or for delivery in the Greater Montreal region. 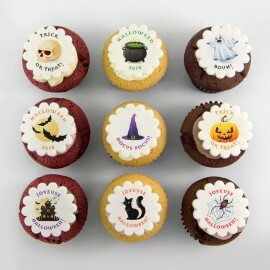 Halloween cupcakes with edible costumed children illustrationsOnly available in store or for delivery in the Greater Montreal region. 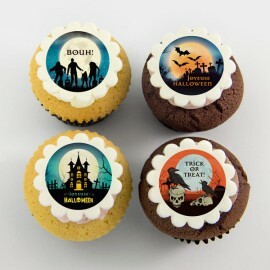 Halloween cupcakes with edible Halloween illustrations - with orange background.Only available in store or for delivery in the Greater Montreal region. 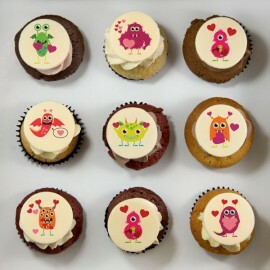 For Halloween, treat your guests or lover with our cute monsters illustrations decorated cupcakes. Edible ink on sugar sheet and marshmallow fondant.